We had just moved to a brand new town, again, with a baby just 10 months old. He was curious, smart and on the go. A resounding question haunted my thoughts as a stay at home Mom. What do I do with him? How do I teach him? Where do I go from here? The Montessori Method flooded my reading material and conversations. I knew where Maria Montessori was from, why she started observing children, and how her methods had changed the way humans thought of the youngest of us. I was sold on the idea that my child would learn his environment best though this method. But how to start? Setting up our house to be a Montessori house was one of the hardest things to do. I scoured the internet and found a small home video on YouTube. The mom seemed young to me and lived in a small home that I probably could have fit in my living room. I was humbled at the things she had done for her son and wanted to mimic the same small details for Samuel. I hope to blog three parts to this series and cover how our playroom, the kids’ room, and a couple other small areas around our home are set up. First, let's check out our play room. We started with a couple rugs. I found the large one at Kmart during an after season sale. I just priced them recently for about $20. The other two were cheap as well. 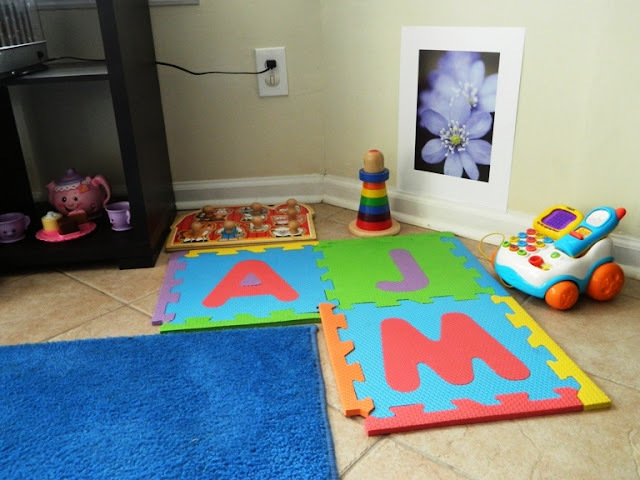 They help Avalyn a lot with traction and give our room a little warmth and color. The windows are so great in this room. 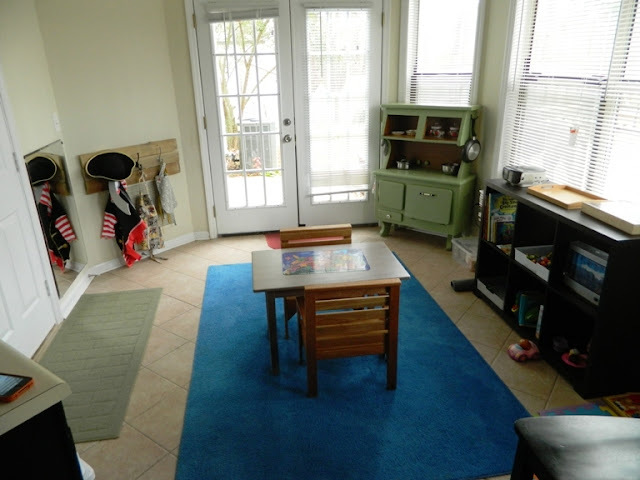 I chose to put the playroom in what should be a breakfast nook, because of the windows. This seems to be an older house so the windows themselves are not great, but the natural light is irreplaceable. First thing I do in the morning is open the blinds to let in the light. I love seeing my kids playing in natural light and help them to notice the trees and birds outside. Putting a play area next to a window is one of the first choices I make when we move into a new place. Next, our mirror. I LOVE mirrors. They are such an amazingly cheap toy that can go from birth to forever! 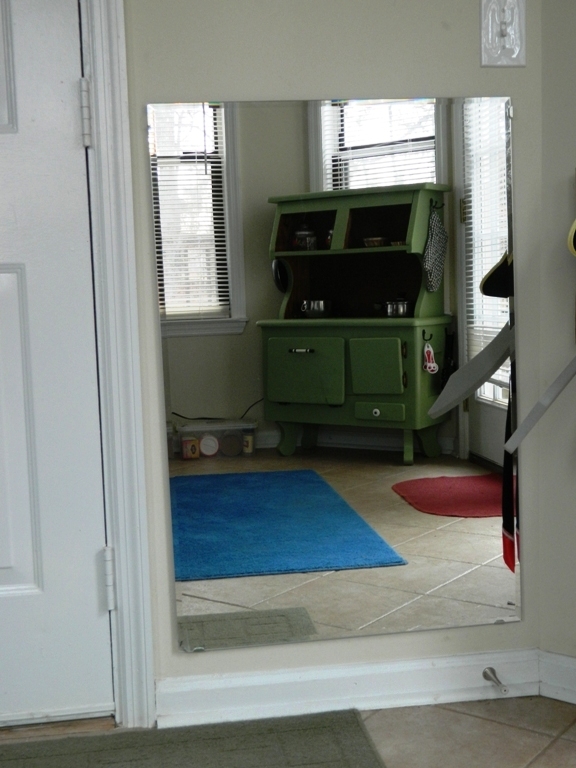 This mirror is usually the first thing to go up when we get to a new house. We found it at Lowe’s Home Improvement. There are often opportunities to find 10% off coupons and we always get coupons like that when we fill out a change of address form. The brackets hold the mirror in so that if either of the kids decides to bang on it, lick it, or smash their face against it, it doesn't move. 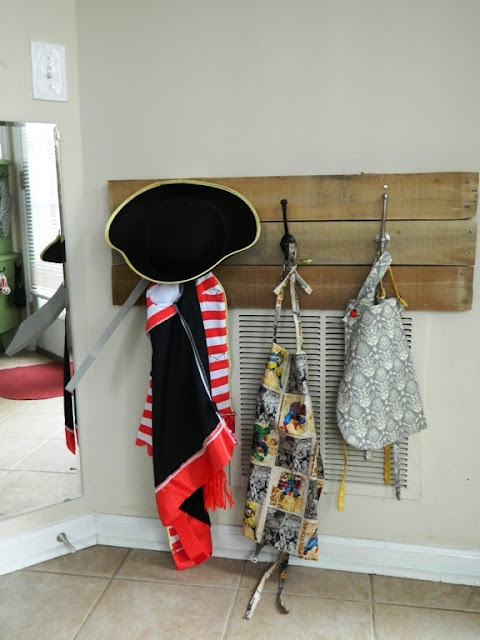 The hooks were made by my brother-in-law and his wife out of an old pallet they acquired. They took it apart, cut the pieces up, screwed them back together and attached a of couple hooks on there. We nailed it into the studs in the wall and use it as our dress-up corner. The aprons were made by my mother-in-law. There are a TON of ideas on how to make great aprons on Pinterest. 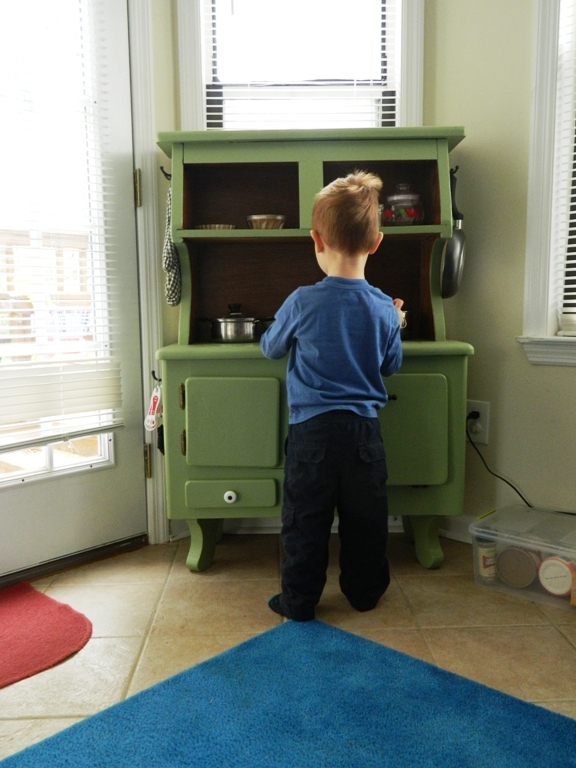 The kitchen is our newest addition from Santa. 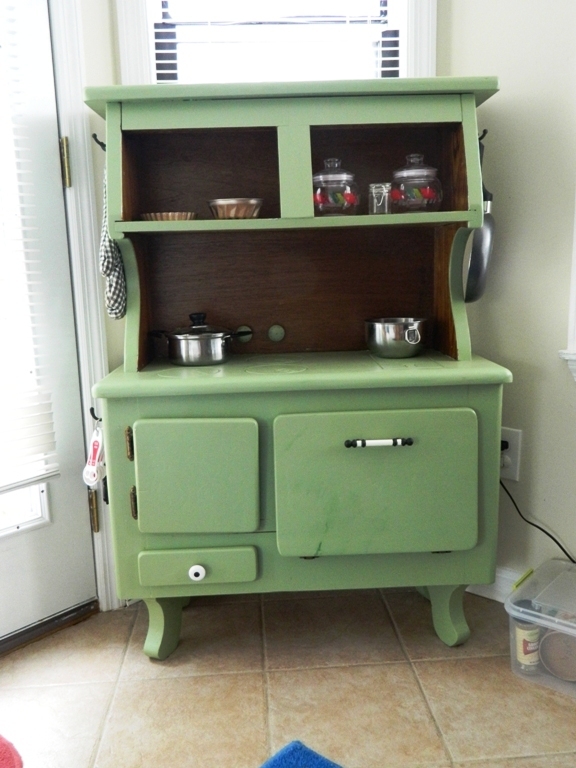 It was found at a Habitat Restore for $40. New coat of paint and a little reworking of some of the doors and this is the end product. Most of the items that are in the kitchen were donated by grandmothers, the rest where on sale and second hand items I found along the way. We anchored it at the top to the wall so that there is no chance for the kids to pull it over onto themselves. This is VERY important now that Avalyn has started pulling up on everything. Samuel thought he would make me some tea while I finished up my pictures. I am always on the lookout for a good, sturdy bookshelf. This one is from Target and is not made very well. We chose to leave off the back panel so it can be used in different ways at different houses. I love the squares. It is nice to have specific places for activities and books. Almost everything on our bookshelf was given to us as presents. I have been very blessed with amazing in-laws and have loving family and friends who love to pass on wonderful books and toys. 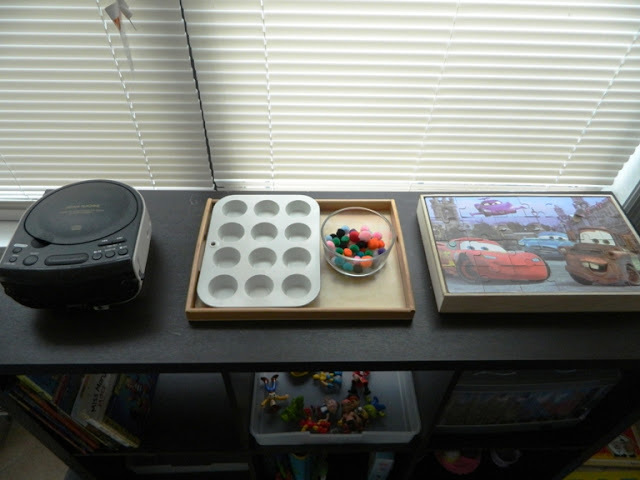 My husband attached a small CD rack to the side of our bookshelf to organize the growing CD collection the kids have. Beside our bookshelf is our work mat. It is actually a bath mat without the rubber on the back. I found it at IKEA for less than $10. The activities on the lowest shelves are for Avalyn mostly and the upper shelves are for Samuel mostly. Both kids play with everything pretty consistently. On the top of our bookshelf are some activities just for Samuel. He loves to change the CDs and play music while he is working in the playroom. Our activity now is color sorting. 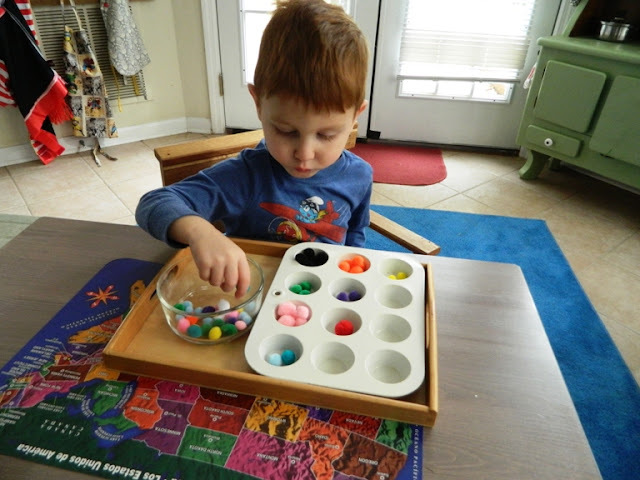 He is 2.5 years old and we have been working on introducing Montessori activities. He has also found a love for puzzles, so we are capitalizing on that focus and have puzzles throughout the house. This is Avalyn's corner. She is 8 months old and really loves having activities at her level. 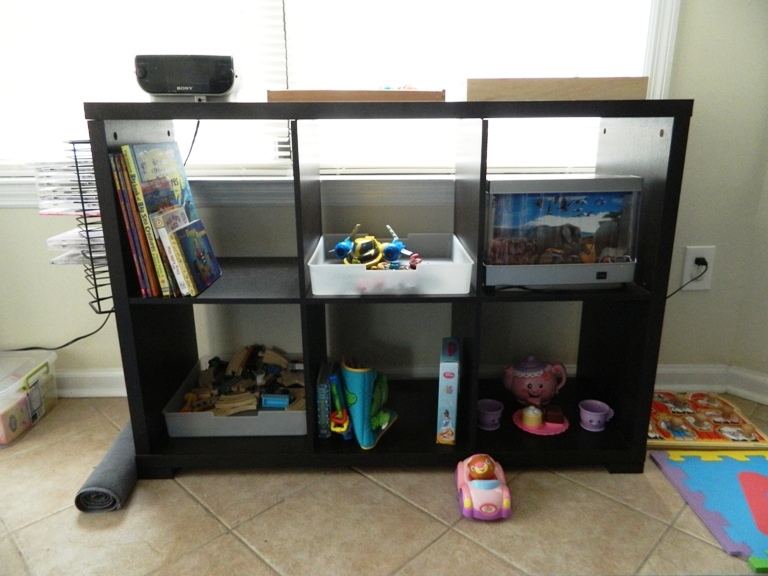 We share all our toys here, but having an area that we can dedicate to the younger Montessori learner is nice. The letter mat is from a large set that was a gift. The picture was a dollar store find. Just something pretty to look at. The wooden color tower is from IKEA for about $8 and the wooden farm puzzle was from Santa. 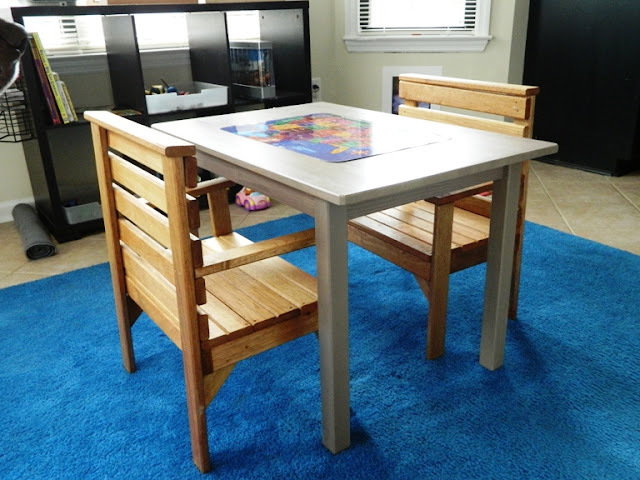 Our table is from IKEA also. 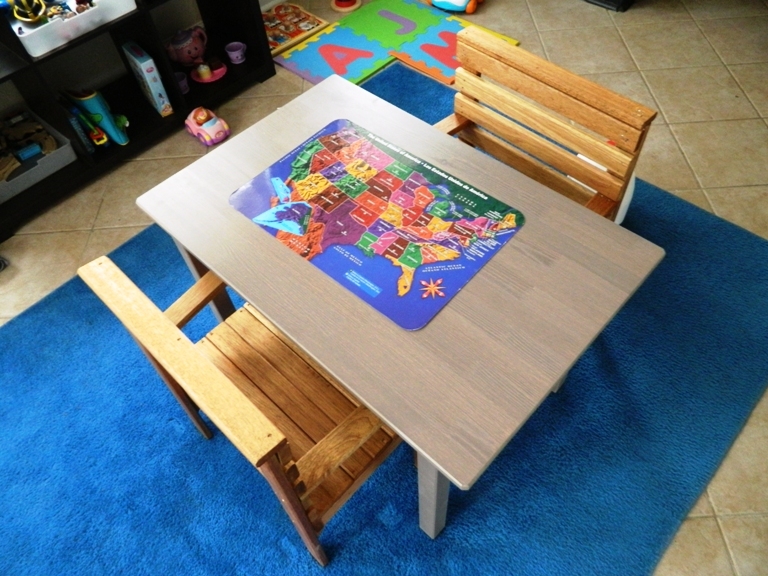 A little more expensive at $40, but we had a cheaper table that went with the chairs and it splintered. It was also planked so not as good for starting our writing projects. This table is the center of our learning. Samuel uses it for his activities and writing. Avalyn loves pulling up to see the world from a different perspective. We spend about 60% of our day in the playroom. The morning light is wonderful, music is educational and calming, and activities are set up to enhance self learning for both kids. 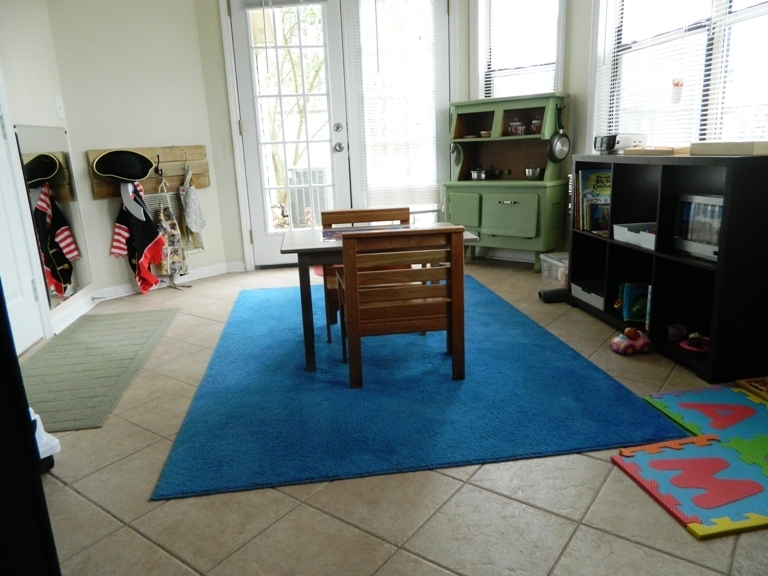 Are you looking for affordable Montessori lessons and activities! I highly recommend Lisa Nolan's affordable online programs! Her programs are here.